Last year, we did the expected, giving you a top four for the College Football Playoff, and added to it with special guest Mark Schlabach. 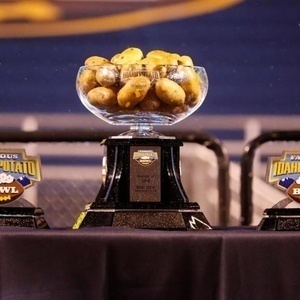 This year, with the help of the Phil Steele (we discuss if he is, in fact, a real person) college football preview magazine and Wikipedia, we highlight four (highly irrelevant) bowl games and choose four great shows to make up for the (irrelevance). We start off in 2001 with a sleeper 1st set pick from May 2001, a sly “Driving Song” sandwich from beautiful Boise, head back to May 2001 with an epic Jazz Fest night show throwdown, and close it out with a couple of rarities from Albuquerque, NM in 1992. And yes, Jeff gives his final four picks since Harvey is apparently looking forward to a college basketball season that will see his beloved Cats lose in the first weekend to Bethune-Cookman. Jeff (who does not like the Cats) likes Alabama, Clemson, Georgia, and Wisconsin (such a homer! ).